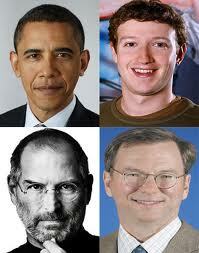 According to ABC News, today in the evening Steve Jobs is going to meet President Obama. Google's current CEO Eric Schimdt, Facebook founder Mark Zuckerberg and GE CEO Jeffrey Immelt will also attend a business leaders' event, said people familiar with the meeting. The goal of the meeting was explained by White House official. "The president and the business leaders will discuss our shared goals of promoting American innovation, and discuss his commitment to new investments in research and development, education and clean energy". Last time President Obama had a meeting with Steve Jobs was in October of 2010. Then President was "eager" to talk with Apple's CEO, said White House press secretary Robert Gibbs, and they had discussed the US economy and technology industry. In December of last year Obama said that Jobs is an impressive example of the American Dream.